Ryan Carter composes for instruments, voices, and computers. Ryan's work often explores new musical possibilities presented by emerging technologies, while remaining critical of the assumptions and unintended side effects embedded in them. Alternately playful, quirky, visceral, and intense, his music has been described by the New York Times as "imaginative ... like, say, a Martian dance party." Ryan has been commissioned by Carnegie Hall, the National Flute Association, the MATA Festival, the Metropolis Ensemble, Present Music, The Milwaukee Children's Choir, and the Calder Quartet, with support from the National Endowment for the Arts, the Jerome Foundation, the American Composers Forum, and Meet the Composer. Ryan has collaborated with the Berkeley Symphony, the Cleveland Chamber Symphony, the International Contemporary Ensemble, the Nieuw Ensemble, the JACK Quartet, the Mivos Quartet, Quartetto Maurice, Yarn/Wire, the Argento Chamber Ensemble, the Princeton Laptop Orchestra, Transit, NOW Ensemble, and many others. Awards include the Lee Ettelson Award, the Aaron Copland Award, the Left Coast Composition Contest, the National Association of Composers/USA Composer's Competition, the Publikumspreis at the Heidelberg Spring Festival, and the LA Phil Prize at Hack Music LA. In addition to composing acoustic music, Ryan is an avid computer musician, programmer, and performer. His iMonkeypants app (available for download on the App Store) is an album of algorithmically generated, listener-interactive electronica. As an extension of iMonkeypants, Ryan founded Headless Monkey Attack, a collaborative project blending live instrumental performance with electronic dance music synthesized in real time from code in the RTcmix programming language. Raised in Wisconsin, Ryan holds degrees from Oberlin Conservatory (BMus), Stony Brook University (MA), and New York University (PhD), where his teachers included Richard Hoffmann, Pauline Oliveros, Daniel Weymouth, Elizabeth Hoffman, and Matthias Pintscher. Ryan has pursued additional studies with Louis Andriessen and Gilius van Bergeijk at the Royal Conservatory of The Hague (the Netherlands) and with Brad Garton at the Computer Music Center at Columbia University. Ryan is currently Visiting Assistant Professor of Music at Hamilton College. Ryan Carter composes for instruments, voices, and computers. Ryan's work often explores new musical possibilities presented by emerging technologies, while remaining critical of the assumptions and unintended side effects embedded in them. Alternately playful, quirky, visceral, and intense, his music has been described by the New York Times as "imaginative ... like, say, a Martian dance party." Ryan has been commissioned by Carnegie Hall, the National Flute Association, the MATA Festival, the Metropolis Ensemble, Present Music, The Milwaukee Children's Choir, and the Calder Quartet, with support from the National Endowment for the Arts, the Jerome Foundation, and the American Composers Forum. Ryan has collaborated with the Berkeley Symphony, the Cleveland Chamber Symphony, the International Contemporary Ensemble, the Nieuw Ensemble, the JACK Quartet, the Mivos Quartet, Quartetto Maurice, the Argento Chamber Ensemble, the Princeton Laptop Orchestra, Yarn/Wire, and many others. 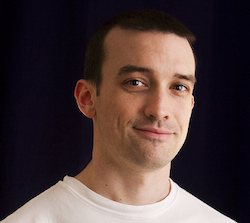 In addition to composing acoustic music, Ryan is an avid computer musician and programmer. His iMonkeypants app (available for download on the App Store) is an album of algorithmically generated, listener-interactive electronica. Ryan holds degrees from Oberlin Conservatory (BMus), Stony Brook University (MA), and New York University (PhD). Ryan is currently Visiting Assistant Professor of Music at Hamilton College.